This is me and my grandmother's dog, Brandy. 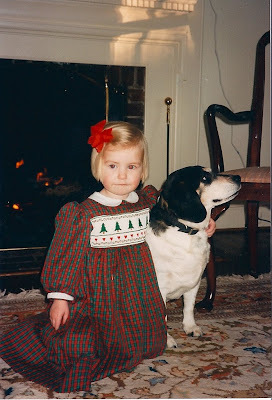 I loved that dog so much. And yippee yi ay, Tucker is a beagle!! :) Reminds me of Brandy so much even though they have different coloring. Okay. Let's pause for a moment. 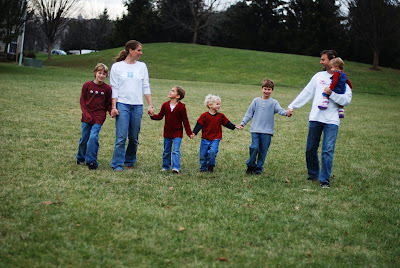 This is the Pastor College family I babysat for last year. We had some good times. Like games of Hide and Scare (for those of you who don't know me, I get scared when people jump out at me. and of course, what better fun then scaring your babysitter? :D) We played outside a lot, and made some good memories. And then in June they moved away. Back to New Jersey. I love you dear family. Love that first one of you! I love them all, actually. =) That is so nice that you were able to bless them by babysitting! aww these are all cute :) i love looking through older pics it makes me so happy!